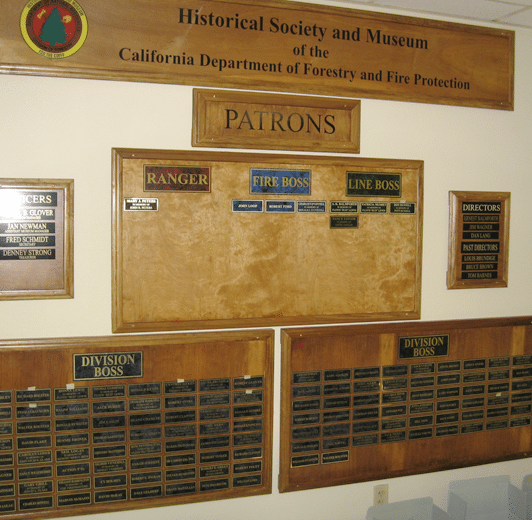 The Historical Society and Museum for the California Department of Forestry and Fire Protection has four classes of membership Directors/Officers, Supporting Members, General Members and Corporate Membership. Directors/Officers must be current or retired employees of the California Department of Forestry and Fire Protection. Supporting members are current or retired employees of the California Department of Forestry and Fire Protection. General members are those individuals, other than current or retired CDFFP employees, who wish to participate in the Museum by maintaining annual membership. Businesses or Corporations may support of the Museum as outlined in the Museum Participation Program. Patron’s levels will be accumulative over time. As higher levels of donations are reached, the donors name will be moved to the appropriate donors’ panel.